Pizzas, cakes, breads and more. Many times there is the beautiful fruit, perfect to prepare a beautiful cake but ... in any case, you need a suitable background. You can opt for the funds in pasta brisè or short pastry but in many cases a softer bottom would be ideal. The ideal in these cases would be a pandispagna or a Genoese pasta; both require a minimum of care and attention. Here is a quick and easy solution! This version of the beef goulash, characterized by the scent of cumin toasted and crushed in a mortar, is the interpretation used by chef Tim Mälzer and taken back to her collection of recipes, Home, recently published. The ingredients are few and the preparation is very simple; the only thing not to forget is that cooking in the pot takes a couple of hours. So you have to get in early enough food. But like all these preparations this is even better the next day: you can then prepare it first and finish flavoring it after having brought it back to temperature. instead of cooking the meat in the cast iron pan intended for final cooking and then remove it and add it after browning the rest of the ingredients, I prefer to brown it in a pan and then pass it in the cast iron pot already on the fire and continue the first phase of the other ingredients in the pan and then add them to the meat. The result is almost identical and the cooking is facilitated. Now just prepare the ingredients on the kitchen counter and start working! The doses given are for five portions but only if used to the German, as a single dish. If preceded by other courses this dish is enough for at least six people of robust appetite! Prepare all the ingredients at hand and begin to cut the beef stew into cubic pieces of about two or three centimeters. Cut onion into cubes and the garlic into very thin slices (with the minimum thickness of the mandolin is a treat). In a skillet, heat the butter well and sauté the beef on a high heat. Then transfer it into the pot already on the fire iron, at a minimum, with the possible addition of butter idea. Brown, in the same pan in which you browned the beef, onion and garlic slices. As soon as the onions are well colored, add the bay leaves, sweet paprika and tomato paste. Cook again for five minutes. Pour the red wine, mix and bring to a boil. Then pour everything on the meat, season with salt and pepper and mix. Pour into the pan 200 cc of water and let it go for a minute on the fire to collect all the rest of the cooking sauce. Pour into the pot, bring to a boil, cover and continue cooking, over medium heat, for two hours. For all the cooking the goulash will just have to simmer. When the goulash is almost ready, pour the seeds of cumin in a pan, without adding fat and toast them until the aroma of the spice is released and the seeds start to jump into the pan. Pass them in a mortar and chop coarsely with the pestle. Add them along with the grated rind of half a lemon to goulash and continue cooking for a few minutes to allow flavors to blend the past with the rest of the preparation. This step is particularly important because it is what gives this dish its characteristic note. The goulash is ready to be brought to the table. Here in the photos was simply accompanied by homemade pasta just seasoned with an idea of ​​dolio EVO. I personally see him married perfectly to a steaming polenta! Recipe, text only: to print or download. Recipe taken from the book "Home"Tim Mälzer, and. Mosaik Verlag. CUMIN: Attention, here is used the Kümmel, in Italian caraway (Carum carvi), not to be confused with cumin, similar in appearance but quite different in the aroma! 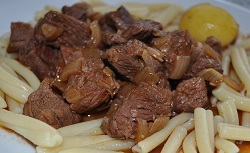 WINEThe author recommends that accompany this Goulash in a glass of the same wine used for cooking: in this case I, personally, would see it perfectly with a Salice Salentino; also for cooking. There are many versions of the gulasch; I have already indicated some, from the typical one with beef and peppers a more particularly, with sauerkraut.